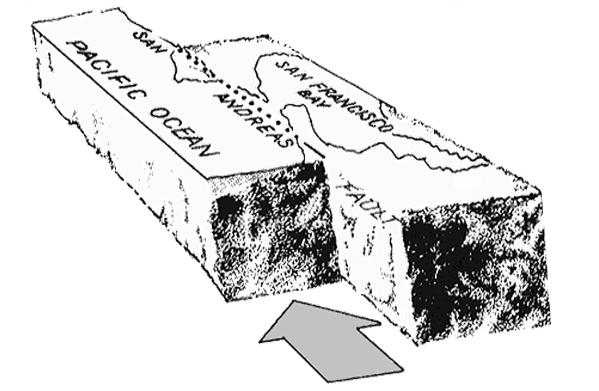 Blocks on opposite sides of the San Andreas fault move horizontally. If a person stood on one side of the fault and looked across it, the block on the opposite side would appear to have moved to the right. Geologists refer to this type fault displacement as right-lateral strike-slip. Movement of blocks along the San Andreas fault. Sudden offset that initiates a great earthquake occurs on only one section of the fault at a time. Total offset accumulates through time in an uneven fashion, primarily by movement on first one, and then another section of the fault. The sections that produce great earthquakes remain "locked" and quiet over a hundred or more years while strain builds up; then, in great lurches, the strain is released, producing great earthquakes. Other stretches of the fault, however, apparently accommodate movement more by constant creep than by sudden offsets that generate great earthquakes. In historical times, these creeping sections have not generated earthquakes of the magnitude seen on the "locked" sections. Geologists believe that the total accumulated displacement from earthquakes and creep is at least 350 miles along the San Andreas fault since it came into being about 15-20 million years ago. Studies of a segment of the fault between Tejon Pass and the Salton Sea revealed geologically similar terranes on opposite sides of the fault now separated by 150 miles, and some crustal blocks may have moved through more than 20 degrees of latitude. Although it is difficult to imagine this great amount of shifting of the Earth's crust, the rate represented by these ancient offsets is consistent with the rate measured in historical time. Surveying shows a drift at the rate of as much as 2 inches per year.